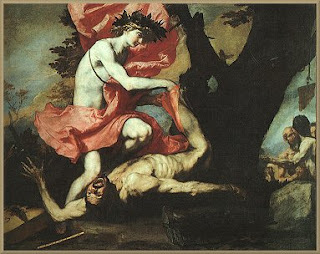 Perhaps the first act of horror inflicted in Greek mythology, an event that would make any male cringe, would be the castration of Ouranos by his son, Kronos. Gaea, infuriated that her husband, Ouranos, would imprison some of their children—the Cyclopes and the Hekatonkheires—in dark Tartaros because they were not as beautiful as the Titans, approaches her son Kronos and offers him a scythe of flint. Prophecy would dictate that the son would rise up and depose the father, and this was the occasion for Kronos to do just that. Vasari's painting does not depict the act graphically, but I am sure very few people don't know what castration is. Later, when Kronos learned that he would be deposed by one of his own offspring, he devoured each one to protect his sovereignty. 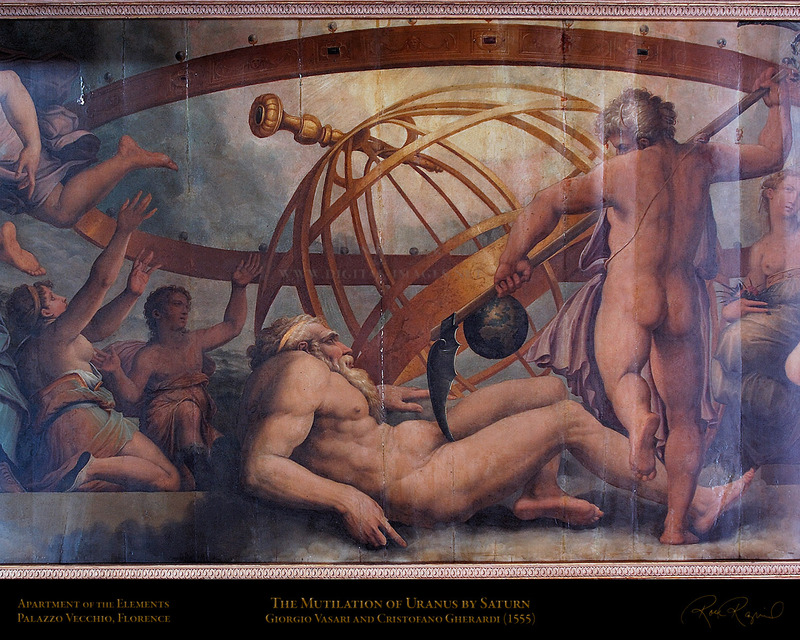 Painters like Goya and Rubens tried to capture the essence of this moment, anthropomorphizing the mighty Titan (referred to as his Roman name, Saturn) to make it easier for us to comprehend. Each of these paintings uses a limited color palette along with a graphic depiction of the act. Goya shows Kronos' eyes to be wide, almost filled with madness. The partially devoured god, identity unknown, lies limp in his hands, and he seems feral and monstrous, unlike the king of the Titans who stood up to his father, Ouranos, and later emasculated him. This would certainly invoke a feeling of horror in those who feel that cannibalizing one's own children is a heinous act, an act of desperation in Kronos' case. Rubens, on the other hand, depicts a more defined image, albeit no less graphic or disturbing. This Kronos (Saturn) seems to be devouring a much younger Titan, almost an infant, and the expression on the child's face as his father eats him alive would probably conjure many mind-numbing nightmares. 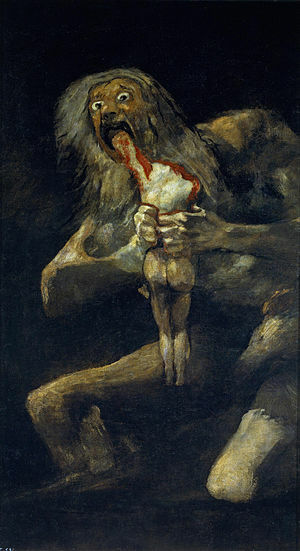 At least Goya shows an already deceased offspring, almost a carcass—Kronos' offspring, in Rubens' painting, seems to shriek in pain and disbelief. No Happy Father's Day here. When Zeus, the youngest of the gods, was hidden away by his mother, Rhea, he grew into a young god ready to stand up to his father, ultimately tricking him into regurgitating each of his five brothers and sisters. With all six Olympians together, the Titans fell, and then Zeus imprisoned them in Tartaros, all except Kronos—Zeus killed him with the same scythe used to castrate Ouranos. Oh, the irony. Other acts of horror, things that modern technology could show very easily, encouraging audience members to vomit, involved other gods, this time, Apollo. A satyr, Marsyas, challenged Apollo to a music contest. Either Marsyas didn't know his opponent well, or he had forgotten: Apollo was the god of music. Needless to say, Apollo won, and for his hubris, Marsyas received a heinous punishment—Apollo flayed him alive. 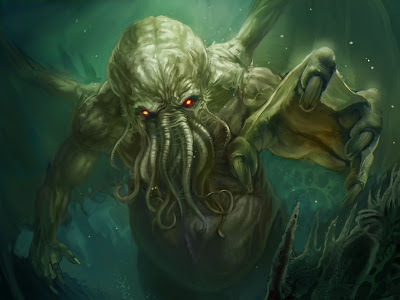 Other types of horror, the kind that one might see in the works of Lovecraft, don't seem to show up in Greek mythology. Seeking forbidden knowledge tends to be an element of Lovecraft, but not just the seeking, but the effect it has on the psyche once found. Learning something about yourself or others meant never to be revealed most likely will have an indelible impression and could bring about madness or worse. Additionally, non-human influences on humanity factor in these stories, and having a creature of a shape one cannot easily wrap his mind around making its way through the world just means that some sanity will shift—an element of horror that can be more effective than gore. When people cannot escape the crimes of those who came before, that inherited guilt leaves one with the anxiety of "Why me? I didn't do that." But, the legacy of a powerful entity on his or her progeny can drive the generations that follow in ways they hadn't considered, or wanted to consider. Something known to many mythologies as well as Lovecraftian lore is the idea of fate. When something cannot be changed, when one's journey must continue no matter the consequence (even when the consequence is known), then this provides a sense of powerlessness, as if one were in a pool of quicksand—and the idea of drowning in your own fate would certainly make my heart race and the adrenaline flow. All of the former aspects certainly come together in a few ways, and they can provide a threat to civilization, regardless of how civilized that culture may be. This pervasive fear links all of Lovecraft's ideas, and that emotional upheaval provides a horror more terrifying than most can imagine. Furthering the horror, separating people by race, ethnicity, and class puts undue stress and prejudice in the minds of others, and this type of horror cuts to very nature of humans (or non-humans, in a Lovecraftian world). When we think about American slavery, Rwanda, or the Holocaust, we see some of the lowest places humanity has ever been. But, in this type of horror, the separation is between different non-humans (but, is it truly any different, when stories like this are allegorical?). 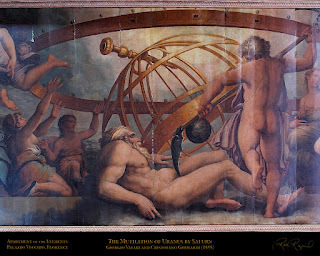 Understanding science has long since been a way to bring order to the cosmos, or at seeing just how science (from the Latin, scire—to know, by the way) provides the vehicle to voiding the darkness around us. The risks of a scientific era means that sometimes, when certain things go beyond the scope of formulae and process, people may not know how to handle those obstacles that rise up because those obstacles don't exist in a recognizable form (human nature shows that people tend to fear what they don't or can't understand). 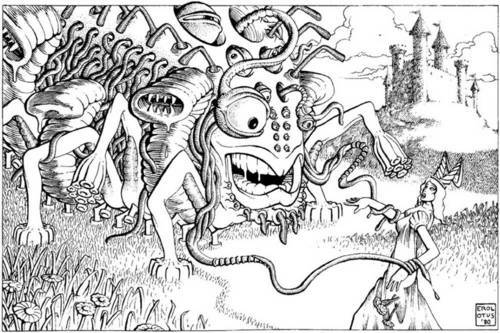 And lastly, Lovecraftian horror uses religion as a divisive tool: basically the gods and monsters one encounters (e.g. Cthulhu) have no concern for mortals and may be hostile toward them. This contrasts the ideas of the Judeo/Christian/Muslim faiths where G-d is a loving entity whom people glorify, and there's a direct connection between Mankind and the Divine. Without that connection, some would feel quite lost and, dare I say, horrified. This deity is beyond form, beyond shape, but Lovecraft's deities take on unnatural bodies. Embracing the horror we see in literature in all forms helps put us in touch with a part of our mind and soul that we don't often see, one that we should embrace in the dark and hope to learn from. Only when our eyes become accustomed to the dark do we fear it less.